3D lamination can be fabricated into contoured and creatively-shaped surfaces while eliminating edgebanding, T-moldings, and visible seams. Engineered for stunning aesthetics and durability, they feature higher impact, scratch and stain resistance than traditional HPL surfaces. How is 3D Lamination Different from High-Pressure Lamination? 3D lamination is applied at a high temperature, high vacuum pressure to perfectly bond between the laminate to the wood core. The conventional process for manufacturing a table top (so-called high-pressure lamination, or "HPL") involves gluing down a thin sheet of laminate to the top of an MDF (particle board) panel. Melamine, or some other low-cost material, is typically glued to the bottom of the panel to protect the wood. Finally, PVC plastic strips, usually matching the color of the top lamination, are glued down to all four edge surfaces. Hundreds of manufacturers use this traditional method of fabricating tops for office desks and tables every day. Due to the inflexible nature of the laminate sheets, the result is a rectangular product with sharp edges where the six sides meet, and usually on all four corners as well. 3D lamination is a state-of-the-art process adopted by very few manufacturers. While 3D laminate film materials are more expensive than sheet laminate, there is an inherent cost saving in labor. This is because a single film of laminate can be wrapped entirely around the top and sides of the wood in a single operation, eliminating the need to separately glue down PVC strips to the four edges of the tabletop. The result is a far superior product at a comparable cost to conventional HPL. With 3D lamination, the wood can be contoured for ergonomic edging and other features, including grommet holes, before the laminate is applied. Once the laminate is applied, the tabletop takes on the look of having been extravagantly carved out of a single slab of hardwood. Same look, a fraction of the cost. 3D-laminated tabletops outperform their HPL competition at every turn. Industry-standard NEMA testing has found 3D laminate to be more than twice as scratch-resistant and three times as wear-resistant as compared to HPL. What's more, 3D-laminated tabletops are seamlessly encased down around all the contoured edges and even through the grommet holes, and thus lack the easily-damaged corners and edges of HPL tops. By sealing the exposed top and sides of the high-density MDF wood that is commonly used in table tops, 3D lamination protects against dimensional instability resulting from water damage or long-term absorption of moisture from air humidity, extending the life of the product. Look at an old office desk and chances are you can see some of the glue holding down the PVC edging starting to degrade. Eventually, this leads to peeling back of the edging, and exposure to moisture damage that can warp the MDF core of the table. With 3D lamination, there are no such edges to degrade over time. There is also no need to cover grommet holes with cheap plastic covers. With 3D laminated grommet holes, you'll want to show off the "core" of the tabletop rather than hide it. While commonly-found household cleaners can damage other tops, ThermoDesk's 3D laminate stands up to a wide range of popular cleaning products, including Lysol, Clorox, and 5:1 bleach formulas. Not only are 3D laminated tops completely nonporous, they also have an extra layer specially designed to protect against abrasion, and another layer to protect against chemical damage, as compared to conventional thermofoil products. Traditionally used in hospital environments, ThermoDesk now brings these same ultra-durable and versatile laminates to the office environment. PVC edge banding and T-molding are fine for school cafeteria tables, but their look is outdated for the modern office. With today's computer-numerical-control (CNC) machining equipment much more imaginative tabletop surfaces can be easily fabricated, but prior to the development of 3D lamination, they couldn't be easily laminated. No other manufacturer of adjustable height tables and desks offers as many color choices as iMovR ThermoDesk. Choose from one of our 11 standard colors or, for bulk orders, one of our dozens of stunning custom colors. Click here to see iMovR's 3D Lamination environmental certifications. 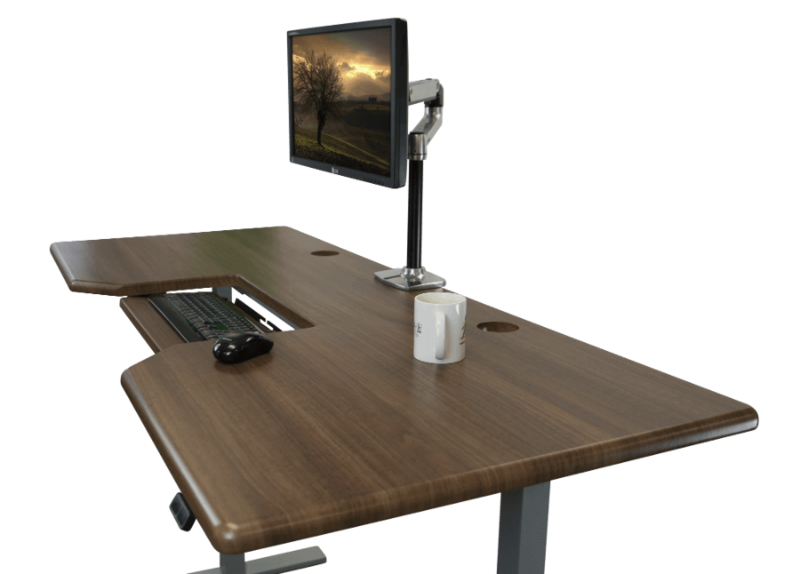 All ThermoDesk products are designed with long-lived form and function in mind. Our 3D laminated tops come with an extraordinary 5-year warranty.